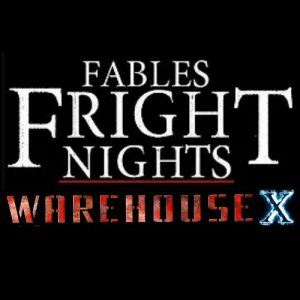 Fables Fright Nights Warehouse X is a Haunted Attraction located in East Dundee, IL. reviewed this attraction on October 21, 2017. The cast of WX was one of the highlights of our visit. They were an enthusiastic bunch who seemed especially proficient at sneaking up on us for a good scare when we least expected it. This happened numerous times during our tour where we thought we had escaped through a room undetected only to have a monster appear at just the right moment to give us a good startle. We did not come across any actors who broke character, even when we interacted with them. We did encounter a few dead spots that really could have benefited from having an actor or three, but the cast as a whole did an admirable job of covering the different scenes. The cast here really seemed to love their jobs, as evidenced by their playful, enthusiastic nature. They really made our time here one of the most fun tours of the entire 2017 season. The costuming as a whole was well done and complete without being overly detailed. Nothing felt out of place or half finished. We saw everything from simple distressed street clothes to more elaborate creations, such as what looked to be authentic attire from the early 1900’s. We saw a similar mixture of the makeup effects, from a simple dirty face to a highly-detailed full face of makeup with prosthetics. While we would’ve liked to have seen a little more creativity and detail, we found none of the characters to be out of place. We noticed colored contacts, professional quality masks and some effective facial appliances on several actors. Warehouse X is located in the building that houses Paintball Explosion, right next to Santa’s Village Amusement Park, which was very easy to find. There is free parking available in the large paved lot, actual restrooms on-site, as well a gift stand and concessions. Worried about waiting in line in the cold and rain? Well, there is no need to worry about that at WX as the waiting is completely indoors. There wasn’t a line at all on the night we attended, so we didn’t see any queue entertainment. The staff here were some of the friendliest we met all season and they seemed to be very passionate about their attraction. Being located on the same property as a family-friendly amusement park doesn’t exactly do wonders for a haunt’s atmosphere. However, the creepy music we heard during the walk from our car to the entrance and the cool “Warehouse X” banners we encountered along the way did help to let us know we were at a haunted attraction. There wasn’t anyone else in line during the night of our visit, so there was no need for queue line actors. The fact that we had to sign waivers before we entered the attraction and hearing the customers’ screams that came from within the haunt did, in fact, get us a little nervous/excited about our journey that lied ahead. We must admit that it was a bit difficult for us to score the SFX as we weren’t entirely sure which of the set pieces belonged to the haunt and which were from the paintball attraction. We thought the rooms were nicely detailed with great lighting and some impressive sound effects. Our favorite portion of the haunt was an open, almost arena-like area on the first floor smack dab in the middle of the attraction. It was a stunning site, complete with a variety of highly-detailed facades illuminated by colorful lighting and a life-sized helicopter flying overhead! The laser guns were, in a sense, one of the best effects as they looked and felt like authentic assault rifles. A few rooms were a little on the “bare bones” side; however, we were informed by management that they will be adding a lot more set pieces and effects for next season. As mentioned earlier, you are supposed to shoot the monsters at WX before they “get you,” which, for us, added a unique element to the fear effect. We found ourselves constantly looking over our shoulders and paying closer attention to our surroundings than we normally would have. 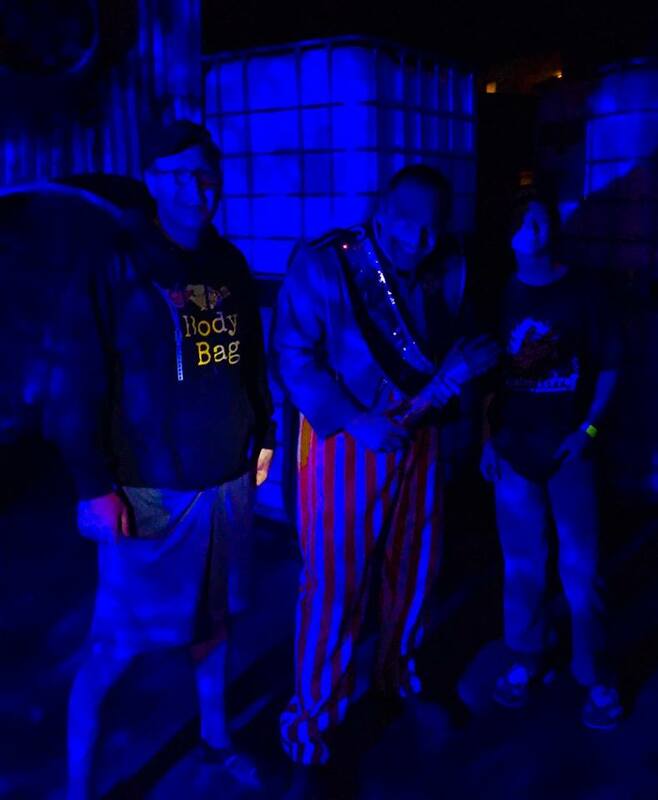 The best way to describe it would be to say that we worked our way through the attraction in an almost tactical fashion, checking all the dark nooks and corners for any signs of movement. While a good portion of the frights were of the “quick, pop scare” variety, they were quite effective because they often times came from places that we weren’t expecting. The actors here did a great job of being unpredictable, attacking from every direction imaginable. We especially enjoyed the monsters who kept coming at us, even though we had shot them several times. It really added to the excitement factor, as was evidenced by our group yelling things like “KEEP SHOOTING!”, and “IT’S” NOT DEAD! SHOOT IT IN THE HEAD!”. There were many sections that had very little light; so dark, in fact, that we had to feel our way around a bit. While we were occupied with finding our way through the dark, the actors did a good job of keeping us on edge by making creepy noises, banging on things and saying things like “We’re gonna eat you.” It would be interesting to see how other scare techniques could be incorporated into the show, especially distractions, which we feel could be really effective. To sum it all up, we can honestly say that we actually felt “scared” at times during our tour, which rarely ever happens to us anymore with visiting 30+ haunts per year. 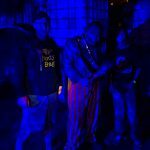 General admission is priced at $25 and a VIP Fast Pass is $35, which we found to be in-line with the average cost of other haunted attractions in the Chicago area. It took our review group 25 minutes to escape, which comes out to 1 minute’s worth of entertainment for each dollar spent. We felt Warehouse X provided a very good value for the money because the quality of the show was very good and, as mentioned before, it was quite unique as well. We were informed that FFN will continue the Warehouse X event next Halloween season and, in addition, they plan to have off-season events such as the Christmas-themed “Warehouse X: Krampus” night and a Valentine’s event in February. This was our first time visiting a Fables Fright Nights event and we can definitely say that it won’t be our last.